Ashwagandha is actually the name of a plant and we use the root and berry for herbal preparation. Actually, the name ‘Ashwagandha’ comes from Sanskrit – a combination of the word ‘ashva’, meaning horse, and ‘gandha’, meaning smell. Ashwagandha is known to assist with reducing anxiety, helping to fall asleep. It is also categorized as an “adaptogen” because its regarded as a general tonic and also aids in helping the body to cope with stress. Now, some people also started to use Ashwagandha for improving their ability to think and that’s where my experience has flowered. I was so surprised at how effective I have found it to be. So much so, I started to read more about it. • It’s often referred to as “Indian ginseng”. This is because of its rejuvenating properties. Botanically, however, ginseng and Ashwagandha are not at all unrelated. • Ashwagandha belongs to the same family as the tomato. They call it a plump shrub with oval leaves and yellow flowers. It bears red fruit about the size of a raisin. • It is native to the dry regions of India, Northern Africa, and the Middle East. However, today is also grown in more mild climates, including the United States. • In India, Ashwagandha is known as the “strength of the stallion” since it has traditionally been used to strengthen the immune system after illness. He also says that “use of the Ayurvedic herb, Ashwagandha can help alleviate these symptoms and support an energetic and rejuvenating sense of well being”. Researchers at the National Brain Research Centre found that mice with Alzheimer’s were unable to retain what they learned, but after 20 days of supplementing with ashwagandha, this improved significantly. The results of the study found a reduction in amyloid plaques (these cause degradation of the brain). Now, let me share my personal experience – it is just like the mice! 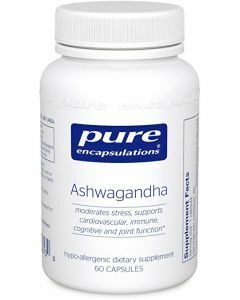 I started using Pure Encapsulation’s Ashwagandha – 500 mg 2 x daily. After just a few weeks I noticed that, as I would often do, I tried to recall ‘something’ and I couldn’t remember it! Could have been a name, a place, where I put something etc. Then, just after a few minutes, the correct answer would come to me. When it first happened, I blew it off as a ‘one time fluke’, but then it started to happen consistently ….aha…. this is really happening …now, I can say without a doubt, that it is happening all the time now. I just give it a few minutes, a sure enough, I remember! quicker than I would like to admit, I know I’m doing something very beneficial to reverse the process. FYI – Dr Chopra recommends 600-1000 mg to be taken 2 times daily,. So I’m gong to ‘up the daily dose’ as well and see what happens. I’ll keep you posted.